Sidekick Kick Mats are the perfect solution for protecting the back of your car seats from muddy little feet. Sidekick comes in a 2 count pack so you can cover both the driver and passenger seats. The size is perfect for full coverage keeping your car seat free from mud, scuff marks and wet feet. Universal fit for most vehicle types. They come complete with handy organizer pockets for drink bottles, food, favourite toys, ipad or ipods. Protect your automotive car seats with quality, durable Sidekick seat protectors. Get your 100% Customer Satisfaction Warranty. No risk to you. To save your back seats use the coupon code to get Sidekick Car Seat Protectors. 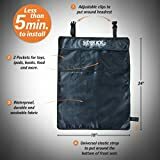 TWIN VALUE PACK- 2 Count pack to cover the back of BOTH driver and passenger seats with these large kick mats that cover 18 inches across and 24 inches down. This mat will cover from the top to the bottom of the back of your seat to easily protect form dirty feet or scuff marks. KEEP YOUR CAR LOOKING LIKE NEW – Protect your investment by looking after your auto car interior upholstery with premium kick mats from Sidekick (frequently bought together with Sidekick Car Seat Protectors). SIMPLE & EASY TO INSTALL – Install both in under 5 minutes. A universal elastic strap around the bottom is flexible to fit most SUV’s, sedans, subaru outback and mini van seats. The top clips fastens around the headrest. EASY TO CLEAN- The long lasting durable 420D polyester dual layer design, will keep on working no matter how many times your child scuffs it with their muddy and wet feet. The water resistant material can be wiped clean with a cloth, or machine washed. 2 IN 1 SEAT PROTECTOR & ORGANIZER- Perfect for not only stopping foot marks, but for organizing and providing easy access to favourite toys, a drink bottle, ipad, books or baby wipes. Your kids will love it. PLUS you get a 100% lifetime warranty. Protect your cars seats now and click the add to cart button.